The Talk of the Town is a local TV show that informs the people of what’s going on around the town. Today Shirley talks about the importance of the snoring complex and the negative consequences that can occur. Ellen demonstrates one of the exercises for Shirley and finds that she might need to look into some of her own sleeping and breathing issues. Enjoy this 5-minute interview and maybe you too can benefit from Primal Air and breathe-retraining. Shirley asks host Ellen to demonstrate one of the key measurements used in orofacial myofunctional therapy. Ellen demonstrates one of the techniques for Shirley and finds that she might need to look into some of her own sleeping and breathing issues. Not everyone thinks that they have sleeping and breathing issues, and not everyone does. How do you know, you ask? There are a lot of different symptoms that can cause you to have the issues and sometimes they happen while you sleep. Drooling, for instance, means you sleep with your mouth open and breathing in all the stuff in the air, this gets filtered if you sleep with your mouth shut and breathe through your nose. 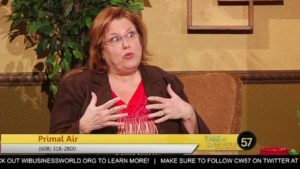 Enjoy this 5-minute interview and maybe you too can benefit from Primal Air, LLC OMT and breathing retraining.